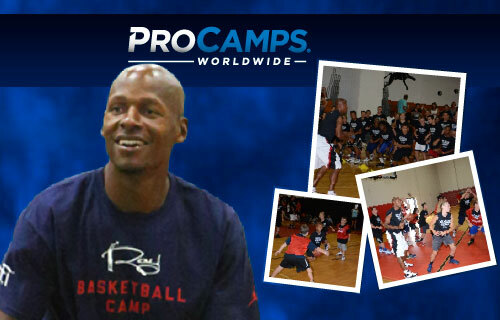 EAST GRANBY CT — Join Miami Heats All-Star Guard and former UConn All-American Ray Allen Aug 02 – 03, 2014 for basketball instruction and fun at the 2014 Citi Ray Allen Basketball ProCamp. Location: East Granby High School. Time: 9:00 AM to 12:00 PM for boys and girls grades 1 – 12. Cost: $149. Source: Procamps.com. Campers will experience various stations, specializing in fundamental skills of basketball. Each camper will be placed on a team according to his or her age. Each camper will be placed on a team according to his or her age. Ray Allen will give talks highlighting the finer points of the game of basketball and beyond. Parents and guests will be able to listen to camp guests in designated areas at each location. Watch the following video where Miami Heats shooting guard Ray Allen is speaking to the players who attended his two day camp in West Hartford, CT at Hall High School in August 2013. Ray Allen is an All-Star Guard who currently plays for the Miami Heat. He formerly played for the Milwaukee Bucks, Seattle SuperSonics and Boston Celtics. During Allen’s first season with the Miami Heat, he averaged 10.9 points per game and made 88.6% of his free throws while playing an average of 25.8 minutes per game. If you would like to book basketball stars like Ray Allen for a speaking engagement, appearance or endorsement, you can contact Ray Allen’s booking agent for appearance & speaker fees at Sports Speakers 360. For booking agent and appearance fee information on how to hire Miami Heat players for appearances, call 1.855.303.5450.